As I said the other day, not much has been reported on the goat boys lately. They don’t change much, really. They just kind of – are. They are silly. They are always hungry. They are always tussling with each other. They are fun to have around. 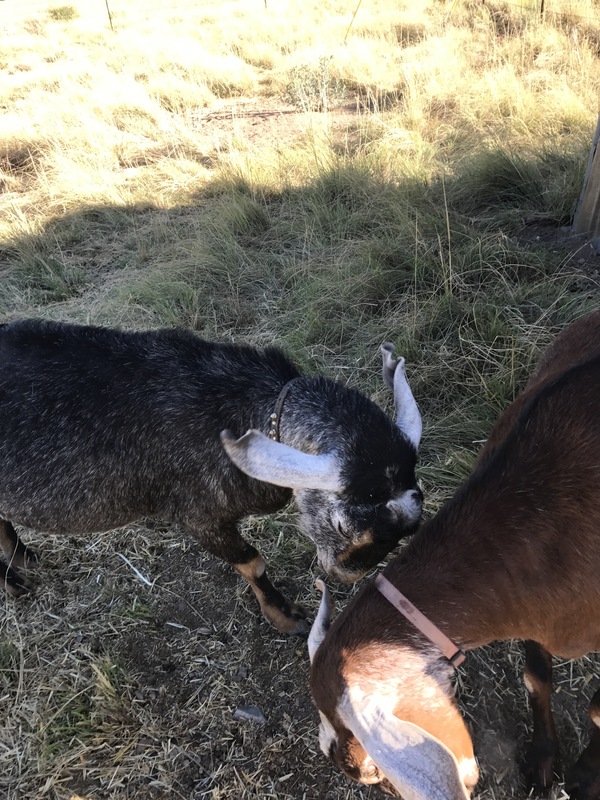 If you haven’t been around since we started, the goats were gifted to Sue from her friend Le Ann. They were getting after her youngsters too much, and she wanted to get rid of them. So, Sue went to California and trucked them over here. It was a frightening adventure for them, it they survived to tell about it and have made themselves at home here. The Black one was named Mine- because he truly thinks everything is his. If there’s food- it’s his, petting to be had- his, brushing- well, he doesn’t really like it, but doesn’t want to miss out, that’s his too! About the only thing he doesn’t claim is the attention from the ferrier- but they’re doing really well with their regular hoof ministrations. The brown one is quiet and sweet and he was named Taco George. He answers to either one or both. We did not pick these names, these are what they came with- too hard to get them used to something new. And, they seemed to fit them well (even if George wouldn’t become tacos). They have been helpful in taking care of the branches from an oak tree that was windfall a few weeks ago. They really like eating that type of brush. They enjoy fresh pine branches as well, whenever we can get them from our neighbor, Tom, who is a landscaper. So, they do their part as much as they are able. They will also be helping to create great gardening when we pull out the old straw bedding from the night building and add it to the new circle garden. 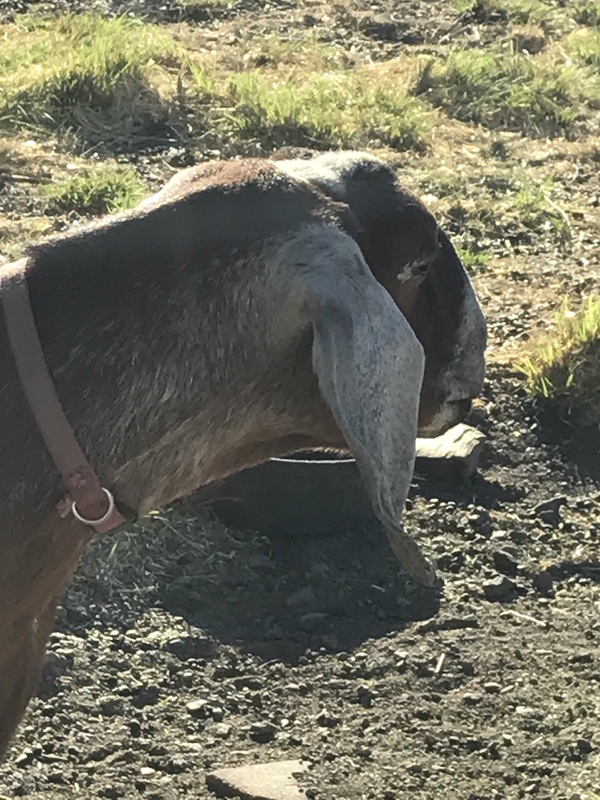 Goat manure is great because it works as a time released fertilizer; their pellets are so compact, it takes a long time for them to compost, but as they do, they slowly release nutrients into the soil. Think long term use! 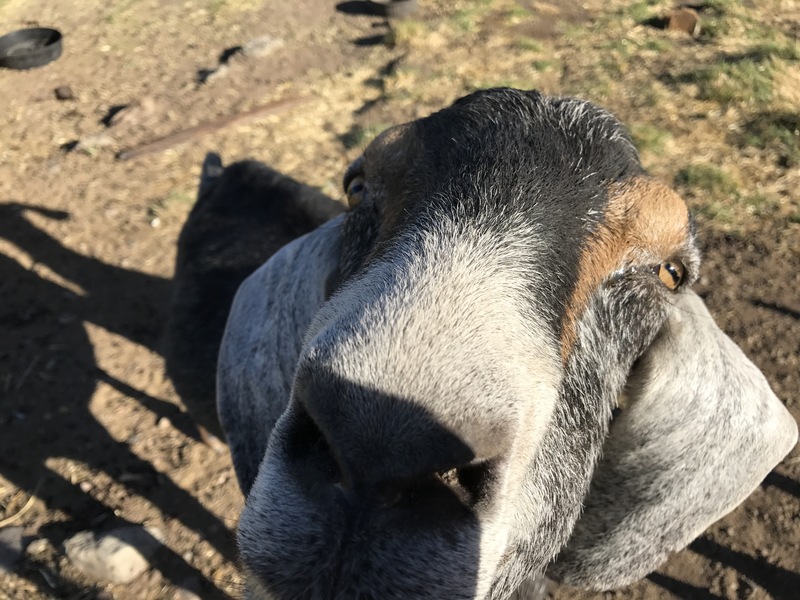 They, enjoy seeing us walk across the pasture at feed time – and even show off a bit. If anyone is doing work out in their immediate area, they’ll hang out with you the whole time. 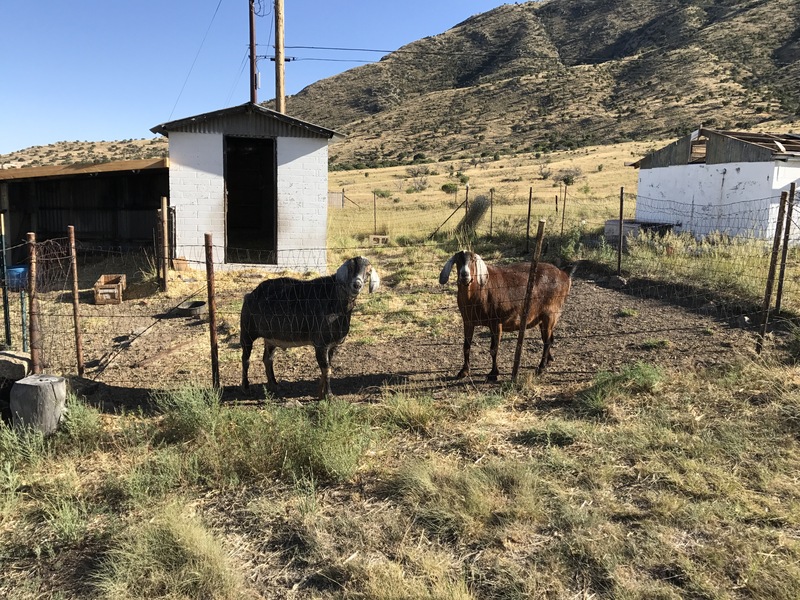 They could get out of their fenced in yard any time, if they truly wanted, but they are very good goat boys. They are getting nice and plump, and we’ll probably have them forever. If that changes, we’ll be sure to let you know! Until then~as always, thanks for reading! Today’s Weather: Windy! Warm though. Egg Report: Eight today and six yesterday.